The Garinko-go, which is the most popularmeans of winter sightseeing in Mombetsu, is a tourist boat which holds 195 persons and breaks its way through the Sea of Okhotsk when it is coveredwith drift ice. It operates from late January when the drift ice arrivesto mid-March, breaking the ice forcefully with the big drill installedin its appealing, brightly colored orange body. The "City Project for International Drift Ice Research" is being promoted to fulfill the hope that the "people of Mombetsu can coexist well with the Sea of Okhotsk in winter when it is closed by drift ice." 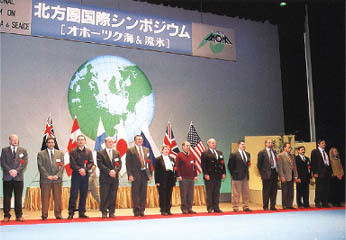 With the Northern Regions International Symposium (started in 1986 with the sea and the drift ice in the Sea of Okhotsk as its special study themes) providing, the momentum, the "Okhotsk Program," based on various investigations and research, has been planned to study the local area specifically. The people of Mombetsu have high expectations for this program, hoping that it will contribute to the optimum utilization of the seas surrounding all of Hokkaido and to international sea study. 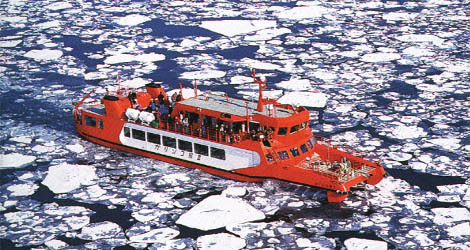 In order to serve as a center for tourism where the Sea of Okhotsk can be enjoyed fully, Mombetsu is planning construction of the Okhotsk Drift Ice World, "Garia," to consist of three parts: a drift ice science zone featuring the Drift Ice Science Center as its main facility, a sea leisure zone and a recreation zone. Its completion is now being pursued. The Northern Regions International Symposium is a key event of the City Project for International Drift Ice Reseach. The first symposium was held in February 1986 to commemorate the 20th anniversary of the Drift Ice Research Institute of Hokkaido Univercity. With many scientists from the northern regions participating , a wide range of exchanges continues, including the presentaion of scientific studies related to drift ice and cooking classes which feature northern cookery.